These rubber stamps and digital stamp designs are reproductions of my hand drawn-original illustrations. All of my digital designs are signed, please leave my copyright and signature (© Mabelle R.O) on the illustrations/design. Each one of this illustrations (rubber stamp and/or digital stamp) are reproductions of hand drawn art by Mabelle R.O. Please retain the copyright signature on the art. You may submit the aforementioned cards/craft projects for publication, but please credit Whimsy and Stars Studio. The images may not be used in any form for commercial reproduction. 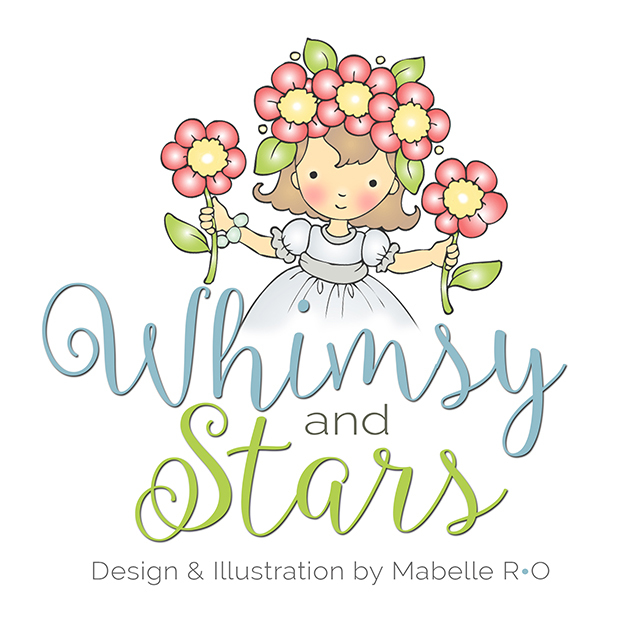 IMPORTANT: All of Whimsy and Stars Studio & Mabelle R.O. rubber stamps and digital files are the copyrighted designs and illustrations of Mabelle Ramirez-Ortiz and may not be reproduced or redistributed in any form, this also includes Image Swaps or Digi Images Electronic swaps. Or sold as part of a kit, as a print out images, a scanned images or CD images or stock images. PLEASE DO NOT post my un-watermarked digital stamp images in Pinterest. Card samples and Pins from my Etsy store are OK.
You are welcome to use my rubber stamps and digital stamps for paper projects or your personal use or to give as gifts. Also, you are welcome to sell your handmade, colored/stamped cards in limited quantities as long as your cards are handmade. You may not resale images as digital files, or colored clip art, or use them as graphics on websites. These designs are not to used as embroidery, stitching, jewelry, wood products, metal or patterns for monetary gain. These designs are strictly for paper arts projects. Color and/or Black and white line versions of my illustrations, whether digital or printed may ABSOLUTELY NOT be sold. You are purchasing THE RIGHT to use my digital designs/illustrations for your personal use. You are NOT buying the illustration/design, just paying for permission to use it on a personal basis. If you interested in licensing my designs or illustrations please contact me directly. Please don’t use the designs on any print on demand services like CafePress, Zazzle, etc or to create promotional printed materials (T-Shirt, cups, bags, etc). Please be kind. Do not redistribute (emailing, sharing, copying, duplicating or reselling) any of Mabelle R.O. / Whimsy and Stars Studio digital designs and illustrations. Your support and love for my art keeps me creating more art to share with you. ** Black and white or colored line versions of my designs/illustrations (print outs), whether digital or printed or hand-stamped may ABSOLUTELY NOT be sold (ex: kits), Blog Candy events, etc. All digital designs images are non-refundable due to the nature of its format. I value your trust and privacy. Any personal information you disclose here at my Etsy store or my website is secure. All transactions are private, as well as your information.